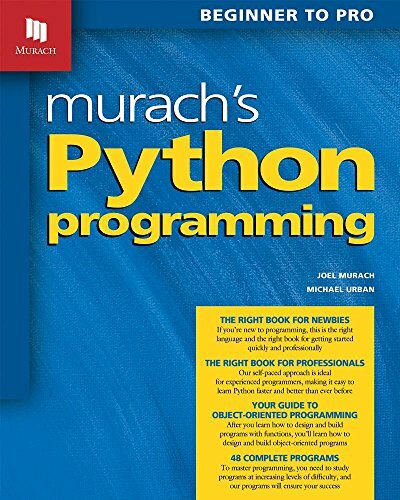 If you want to learn how to program but don't know where to start, this is the right book and the right language for you. From the first page, our unique self-paced approach will help you build competence and confidence in your programming skills. And Python is the best language ever for learning how to program because of its simplicity and breadth...two features that are hard to find in a single language. But this isn't just a book for newbies! Our self-paced approach also works for experienced programmers, helping you learn faster and better than you've ever learned a language before. By the time you're through, you will have mastered all of the Python skills that are needed on the job, including those for object-oriented, database, and GUI programming. To make all of this possible, section 1 of this book presents an 8-chapter course that will get anyone off to a great start. Section 2 builds on that base by presenting the other essential skills that every Python programmer should have. Section 3 shows you how to develop object-oriented programs, a critical skillset in today's world. And section 4 shows you how to apply all of the skills that you've already learned as you build database and GUI programs for the real world.